In the latest issue of Margaret (bi-weekly shoujo manga magazine published by Shueisha), released on November 19th, it was announced that Aida Natsumi's manga 'Switch Girl!!' will get a live-action drama adaptation. 'Switch Girl!!' 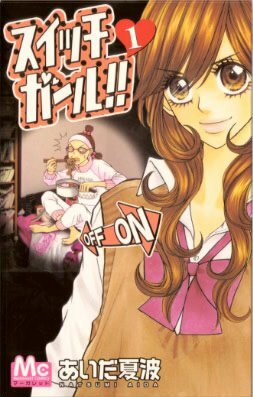 is a school comedy centering Tamiya Nika who is a�charismatic popular�gal at school, but she turns sloppy in her private time. �The manga has been serialized on Margaret since 2006. The protagonist will be played by 'Seventeen Magazine' model, Nishiuchi Mariya, and the male male character Kamiyama Arata will be played by Kiriyama Ren. �The drama will be produced by Azuma Yasuyuki who previously produced popular dramas "Liar Game Season 2" and "Hachi One Diver". The drama adaptation of 'Switch Girl!!' will start airing on December 24th on Fuji TV TWO (communications satellite). Thanks to yayami for the tip!